Strictly’s Swanny Shimmies into Sneinton! We’ve always been incredibly lucky to have great neighbours at Curious, but our beloved, long-suffering chums at Stencil took it to the fabulously-glittered-disco-ball next level when we were invited to the uber-secret reunion gig of Dr Comfort and the Lurid Revelations at The Fox & Grapes on Wednesday evening! Keeping a lid on the news that not only was Stencil boss-bloke, Andy Afford reprising his formidable geetar-wielding stage persona and getting the band back together, but Graeme Swann would be stepping back up to the microphone aaaaand the full force of fabulosity that is the Strictly bandwagon was rolling into Sneinton Market! The Curious workshop was turned over to a dressing room for the super-glam backing vocalists, Paula and Nya, to ready themselves. We presumed that it would be a flurry of glitter and gargling, but when we popped in with light refreshments, they were squealing with delight over our massive collection of Ladybird books and reliving their childhood bedtime stories! 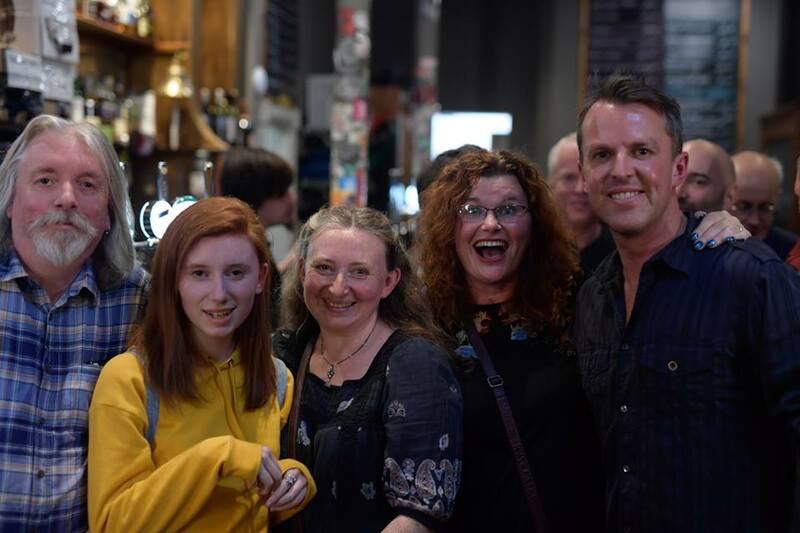 When they stepped onto the stage, they absolutely blew us away and when the tiny, but beautifully put-together Oti Mabuse stepped through the doors of our incredibly local ‘local’ the excitement was almost too much to bear! As a massive music fan, I’ve been to more than my fair share of gigs and although all too brief and gloriously chaotic, I can honestly say this was one of the most joyous gigs I have ever attended; rocktastic, full of smiles, laughter and beautiful, genuine friendships. Thank you so much for allowing us into the Stencil / Strictly secret society, Aff… Can’t wait for the show tonight – go team OMGS! Get the full 9 yards here at Stencil! P.S. Big Up, to the photographer to the stars, Paul Carroll for the fab photo of Team Curious and Swanny in full effect! Avenues BBC Beards Chitty Chitty Bang Bang Curious Nottingham Curious Perambulator Dancing Glitter Graeme Swann Jess Kemp Mabuse OMGS Oti Mabuse Sarah Manton Sneinton Market Strictly Strictly Come Dancing Swanny Urban Greening Veg Power vintage Singer Wheee!